As they say, “there is a first time for everything,” and over the course of the last year I have had many “firsts.” From my first event in the 49er class to my first Olympic level Laser event, it has been a tough, but rewarding, year. Last winter, amidst all the snowstorms, I made the drive down to Miami, FL to compete in the 2011 Rolex Miami OCR, perhaps the hardest and yet most memorable event in which I have participated. Having never sailed the boat in which I was supposed to compete (the blazing fast, twin trapeze 49er), I went down a week early with my crew, Andrew Brazier from Canada, and trained for the week preceding the event. Before we even could think about sailing, however, we had to figure out a way to get the boat from Connecticut to Georgia without a trailer (we were picking up a trailer in Georgia, and would use it to get the boat from there to Miami). After some investigation, we decided that the best way to do it would be to put the boat on top of the car. Easer said than done, especially considering that the boat is as long as the car and a little wider. Several last minute trips to the hardware store and a few whispered prayers later, we set off. After driving down to Georgia, we were looking forward to some relief from the constant worry of having a boat on the roof, but were surprised to see how big the enclosed box trailer actually was. After a few hours of re-packing and tying everything down, we set off again with the destination being the Miami Rowing Club, the 49er venue at OCR (Olympic Classes Regatta). Now, we could focus on getting me up to speed in the 49er. From the moment I set foot on it, I realized that this boat was a “different animal.” In just seven knots of breeze we were fully powered up and planing both upwind and downwind, a new and different experience which led to many spectacular wipeouts. At the end of the first week though, I felt reasonably comfortable in the seven to ten knot wind range, having had plenty of practice in these conditions. Then came the event itself: 29 teams from around the world, with five of the top ten in the world at the time deciding to make the trip. 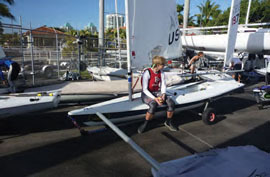 Not only was the competition stiff, but the wind decided to give us a nasty surprise as well: 18-25 knots of breeze and steep chop for four out of the five days of racing, conditions which are not commonly associated with Biscayne Bay. Under the circumstances, I was not expecting a good result, and instead focused on getting a “feel for the class,” as well as on raising my level as a sailor. Needless to say, sailing against elite sailors from around the world taught me a few important lesson about what it takes to get to such a high level in the sport, lessons which I would like to pass on to the rising juniors in the Northeast. Most importantly, I realized that you cannot beat time in the boat — sailing day in and day out for most of the year, as well as having a true feel for the boat is the most important thing when it comes to sailing at an Olympic level. When the wind hits 20 knots, you can clearly see which teams have this sort of feel for the boat, and which do not. Equally important are preparation and attention to details. 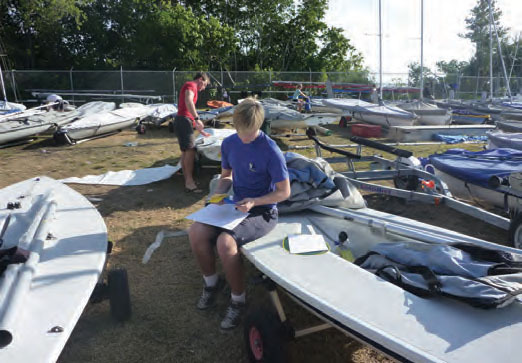 At such a high level, gains and losses are measured in inches rather than boat lengths and thus the top teams spend a lot of time working on the boat, making sure that they have the fastest boat possible, with nothing being too small or too unimportant to address. Lastly, I realized the importance of a saying that is often heard at junior events in the area: “imitate, imitate, imitate and then innovate.” When it came to figuring out how to jibe the boat in 20 knots of breeze or how to bear away at the windward mark, there was no sense in trying to re-invent the wheel. Rather, it was much faster and easier to go to the top teams and ask, “How do you bear away and jibe the boat?” This allows you to leapfrog a lot of the learning process and get to a higher level at a more rapid pace. Once you get near the top though, it is then important to try to figure out something new, which will give you a competitive edge. I was able to observe the “innovate” part of the process when I saw the British teams not hooking into the trapeze until after they had completed their jibe, rather than in the process of doing the turn. I carried these lessons from competing against the top teams in the world with me into the summer. During the summer, I made the transition from the Laser Radial class, in which I had been frostbiting for the last five years, to the Laser Full rig. Having secured top finishes at several events, with the culmination of my season being winning JSA (Junior Sailing Association of Long Island Sound) Champs and a 29th overall (second junior) at the North American Championship, I decided to once again test myself at this year’s OCR, this time in a boat with which I was familiar, i.e. the Laser. I found the trip down this time far less eventful, having already done it just two weeks earlier to do the Orange Bowl Regatta. The competition level, however, was the same if not higher than last year. This being an Olympic year, many of the sailors who are on the home stretch before the Olympics were in attendance, including the last Gold Medalist (Paul Goodison), all of the US Sailing Team AlphaGraphics, and many top sailors from around the world. The event once again had no shortage of breeze with almost all of the 10 races being run in a 10-12 knot southeasterly. Similar to last year, the event itself was tough both mentally and physically, but I managed to stay focused and learned a great deal from it. Finishing 68th was not ideal for me, but it made me realize that in addition to all the lessons I had learned the previous year there was a bigger one, which I had missed. This final lesson is that top sailors, in addition to things I have already observed (spending time in the boat, meticulous preparation, imitation then innovation) also attend an extraordinary amount of events, and constantly keep testing themselves against other great sailors. When trying to raise your level the most important thing is that you attend as many events as you can! As a result, I now try to compete in as many events as possible. By doing so I hope to further my sailing ability and raise my level another few “notches” before I enter the college sailing circuit next year, as a Freshman at Harvard. Marek Zaleski lives in Norwalk, CT and sails out of Noroton Yacht Club in Darien, CT. He is a member of the Fairfield Prep Varsity Sailing Team.